Nika to be Published by Eagle Games! Major news: I have officially signed and sent my contract for Nika to Rick Soued, owner of FRED Distribution! 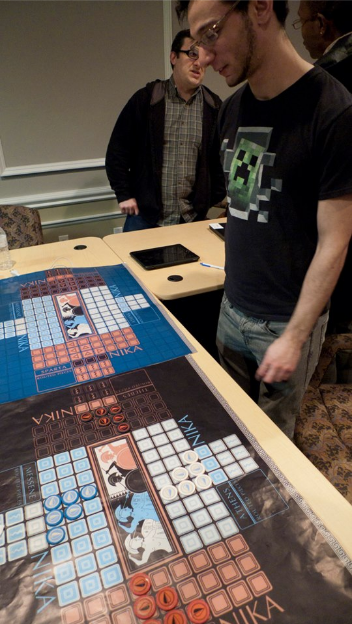 Nika will be published under the Eagle Games brand, either late this year or early in 2014. Ευχαριστώ πολύ to everyone who contributed their time and thought to testing it out over the past two years. Particular thanks go to Chris Hernandez for creating the board and piece art, and to the NYC board game playtest group for their expert feedback. There will be a Kickstarter to fund it at some point – rest assured, I’ll let you know when that happens. Also, get in touch with me if you want to set up a time to play Nika. Otherwise, on to the next game! 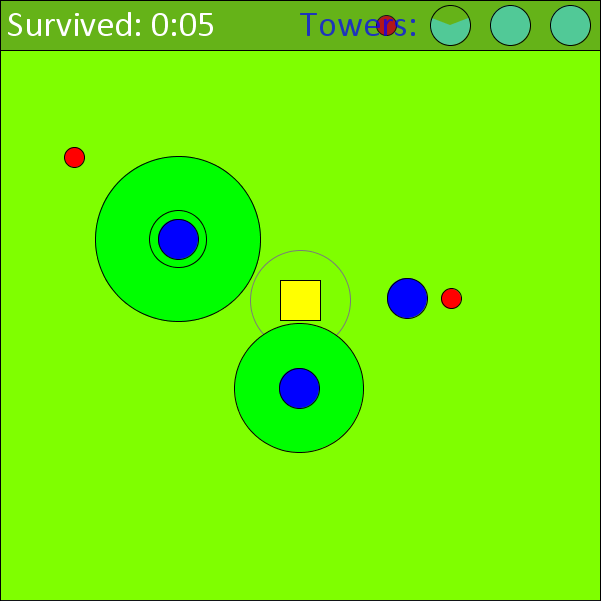 Here’s a little tower defense game I whipped up. It was inspired by the theme of this year’s Global Game Jam, “heartbeat”. I’ve been working on it sporadically for a month or two. Not exactly a polished release, but it is pretty fun. Just defend the treasure in the middle as long as you can. You should be able to figure out how it works pretty quickly by just messing around. My longest survival time is 1:08. Can you do better? First things first: If you want to play Nika, I’m going to start bringing it to the NYU Friday playtests, starting this very Friday. I may ask experienced players to test new variants, but mostly I just want to give people a chance to play the core game. 1. Matthias Worch’s talk at the Level Design Bootcamp. It was pretty high-falutin’, exploring Marshall McLuhan’s differentiation between oral and print culture. Since games can combine the experiential, mutable nature of traditional storytelling with the exploration of complex themes and concepts of literature, they have the potential to fulfill McLuhan’s prediction of a modern “secondary orality”. 2. James Russell’s discussion of mechanics design in Total War games. He argues that in order to create games that involve as many systems as your average TW title, you need to explicitly model these systems so you can control their overall direction and shape. Also he revealed Total War Arena which hooooly crap that looks amazing. 3. Finally getting to try Spaceteam. Yes. Somebody give me an iPad. I need to play this game forever. 4. Fellow CA Keith Nimitz’s mind-boggling 7 Grand Steps. Honestly this may have been my favorite game of the conference. It’s a little hard to explain, but basically you control a family across several generations and ages, building up your legacy. It took him two years to write, and the sheer amount of story is incredible, particularly since the forking paths in the various mini-adventure sections rarely seem to reunite. I’m not really doing it justice, but seriously, keep an eye out for this one. 5. Experimental Games Workshop! They were all pretty awesome, especially Searchlight by Margaret Robertson and Adnan Agha. This is a game taken straight from my childhood fantasies. A green light moves back and forth across a play area, and you have to freeze when it’s on you. You win by moving little blocks around the play area, or something like that. It’s an installation game, so I’ll have to hunt it down sometime. Aaand in other news, I had a lovely demo of Nika at the IGDA NJ Demo Meetup. Special thanks to Brian Chung for running it, and to GJ Lee for taking a decent picture of the game, a feat I have yet to manage.